GearBrain has tested several home security systems that you install and monitor yourself, part of the do-it-yourself or DIY group of products. Some are very easy to install while others offer special perks, like HD security cameras with free video storage — unique individual advantages for today's smart homeowner. Recently, we tested the starter kit from Scout Alarm, a pioneer of the DIY home security market that focuses on customization, systems that make it very easy to add devices like motion, door or window sensors to their set-up. Scout Alarm impressed us, along with the number of third-party devices, like smart locks and cameras, you can easily integrate into their kit. We'll walk you through what we found. Scout Alarm makes DIY installed and monitored home security systems, along with services to monitor your products without a contract. Its Scout Small Pack includes a base unit, door panel, two access sensors for your door and window, plus a motion sensor. All the sensors come in different colors and finishes to blend in with your home's décor — a nice touch. But what stands out to us us Scout's ability to offer customers a way to customize their products, and at an attractive cost. 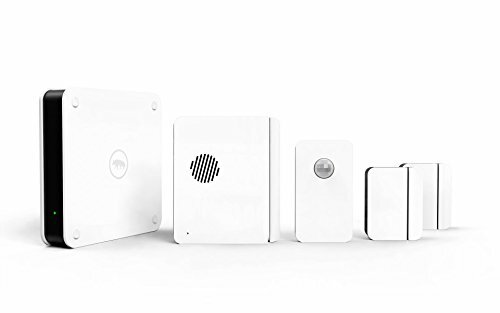 After testing many DIY home security systems, Scout Alarm's Small Pack is the first we've found that doesn't require any tools to setup, and still provide monitoring of your space 24 hours a day, seven days a week. You don't need a screwdriver, wire cutter or a drill. All of Scout Alarm's sensors are designed to easily stick on — and come off — the walls with adhesive tape. If you rent or move, and want to take Scout Alarm with you, simply pull off the sensors and bring them with you to your new home. This is a nice feature that many DIY home security systems don't offer, instead requiring you attach sensors to walls or doors with screws, making them harder to remove. To install Scout Alarm, start by connecting the Scout Alarm base to your home router. Next, download the Scout Alarm app from either the App Store (iOS) or Google Play (Android) and follow the instructions to pair the sensors. In the app there are diagrams to show you where to place the access sensors on a door or window, as well as video tutorials in the Support section. We recommend first visiting this Support section if you run into issues, and follow up with Customer Support if you need additional help. We had a few power issues when testing the Scout Alarm system, and customer service was extremely helpful. Before installing any of the sensors, make sure to pair them with the Scout hub. Start by placing the sensor next to the hub and pulling the strip out of the device. This activates the batteries inside the sensor and starts connecting them to your system. The Scout app will take you through this process. Once the sensor has been recognized, you can label it and then positioned it on the door, window or wherever you want to monitor. Note that all sensors need to be within 150 feet of the Scout hub. If not, the sensors might not function properly and result in less than optimal security for your home. The sensors need to be positioned close to each other to create a seal — that's how the sensor is monitored. When separating the sensor, the seal is broken, which produces a beeping sound indicating the alarm is triggered. To check to see that they're working, separate them to test the beeping sound. If you don't hear one, it means the sensors are positioned too far apart. Additionally, you can also look in the app to see if the sensors are shown closed or open, which is a nice feature not many other DIY home security companies offer. Once the sensors are in place, you can now setup modes to monitor your home. It works like If This Then That (IFTTT), where "If" is the device and "Then" is the action. For instance, if you want to set up an "away mode" you would select all the sensors under "If" and then select siren under "Then." When this mode is activated, an alarm will sound, when any sensor goes off. Scout has eight different ways to notify you: siren, countdown chirp, custom alarm delay, email notification, phone call notification, push notification, text message notification and professional monitoring. Overall, the installation of the Scout Alarm system should take about 30 minutes, depending on the number of sensors you install and if any cameras have been added to your system. While Scout Alarm is a DIY installed and monitored home security system, you do need to sign up for a plan in order to buy their system. You don't, however, have to pay for monitoring until you activate the system. If you want a true DIY home security system that you self-monitor, you can purchase a Scout system and opt out of the plan. Just note that if you do opt out of a monitoring plan, you can only arm and disarm your Scout system using the key fob. Scout does offer two professional monitoring packages: Always ON and Always On+. Both come with UL-Certified services that dispatch help through the police and fire departments. If you add cameras to your Scout Alarm system professional monitoring services, you also get a verified video response. Always On plan costs $9.99 per month ($107 per year if you pay upfront, a 10 percent discount) which includes a 4G LTE cellular and backup service. If your power goes out, the cellular service stay active, keeping the Scout Alarm system working until power is restored. Adding a camera to your Scout Alarm system, adds an additional $2.99 per month per camera for camera cloud storage. The Always On+ plan costs $19.99 per month ($215 annually if you pay upfront) and is the same as the Always On plan — except you get free camera cloud service for one camera, and pay just $2.99 per month for any additional camera you want to store videos. Amazon Alexa – You can arm and disarm any Amazon Alexa enabled device (i.e. Amazon Echo, Echo Dot, Echo Show, etc. ), Google Home and Assistant, and you can arm and disarm the system on Google home and Home Mini. IFTTT – There are 45 applets for you to allow Scout to connect with different apps and devices. Some of these applets will let you auto arm/disarm your system using geofencing. Another one offers one-touch panic button creation. You can also use IFTTT to make your Scout system compatible with August Home, Arlo cameras, D-Link, ecobee and Samsung SmartThings. Nest: Scout Alarm is part of the Works with Alexa program. If you have Nest cameras, Nest Protect or smart thermostats you can do a few good smart home integrations. For cameras & Nest Protect, you will be able to get alerts if motion is detected or the smoke/co2 sensor is triggered. For Nest smart thermostat owners, you can integrate commands that will turn on/off your Nest Thermostat when your system is armed/disarmed either manually or automatically via geofencing with IFTTT. Though this is an automation that is not really security related, its one that can save you money on cooling and heating bills. Smart Lights: If you have either Philips Hue or LIFX smart lights, these lighting systems can be set to turn on and flash certain colors when the Scout Alarm system is triggered if desired. We also found several other functions possible using IFTTT applets. Smart Locks: A new partner of Scout Alarm is Yale Real Living Locks. If you have a Z-Wave Yale Real Living smart lock, you can lock/arm and unlock/disarm Scout automatically from anywhere in the Scout Alarm app. You can set unique passcodes for guests, delivery people, dog walkers, or anyone else with time & day restrictions and expirations if desired. Scout Alarm also works with Kwikset SmartCode Z-Wave or Zigbee door locks. Installation is similar to Yale Real Living Smart locks. First your set up the locks in their app and then pair the locks with the Scout Alarm app. Once paired, you will be able to setup modes in the Scout app that will lock or unlock the door locks when you arm or disarm your system. Nice integrations. First Alert Smoke Detectors: Scout Alarm has an integration with First Alert Smoke and CO Alarm. If you want to a device that can monitor smoke and carbon monoxide in your home, this and Nest Protect are the only two devices you can add to your Scout Alarm system and control them in the Scout app. Zigbee or Z-Wave Equipped Sensors: Scout Alarm works on either a Zigbee or Z-Wave wireless connection. If you have a Zigbee or Z-Wave motion sensors, I would suggest contacting Scout Alarm to see if they would work with Scout Alarm. They might be able to get these devices to work with your system. In addition to the above connected devices, you can also add glass break sensors, water leak detectors and indoor cameras from Scout Alarm. On Scout's website, you can find the name and cost of these devices if you add them to your Scout Alarm kit. Scout Alarm offers you two ways to buy its devices: create your own customized setup, or buy one that's pre-packaged. Package options include the Scout Small Pack for $299, which includes one hub, door panel, motion detection, two access sensors, two key fobs and one-yard sign. 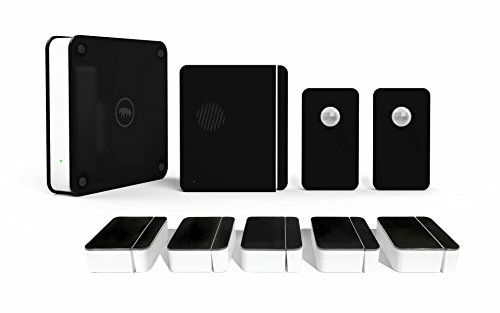 There is also the Scout Large Package, at $499, which comes with one hub, door panel, two motion detectors, five access sensors, two key fobs and a yard sign. The Scout Elements Pack is $500 and comes with a smoke and CO detector, which is like the Scout Large Pack except it comes with a water leak detector, First Alert Smoke and CO detector, and one less access sensor. The biggest security package is Scout Architect Pack for $799, which includes the same items as the Scout Elements Pack but with a smart lock and glass break sensor instead of getting a smoke and water leak detector. If you would rather build your own system, Scout makes that very easy. You can add a hub and door panel, then select a smoke detector and camera, or door locks without sensors. Do make sure you know how much these items costs — as some of the third-party devices Scout offers, like cameras, locks and smoke detectors, can be little pricey. For example, the smart locks on Scout's site are priced at $229 — you can buy a Yale Real Living Z-Wave smart lock on Amazon for less. The price of the First Alert Smoke and CO detector on the site is very good, however, and much less than what you can buy on its own. With all good things, there are some areas for improvement. A true DIY installed and monitored home security system does not require a monthly monitoring plan. Instead, Scout requires that you buy a monitoring plan to keep your system up and running if your internet is lost, or the power goes out in your home. But we think it would be nice if they offered users the option to not select this plan, and buy a true customized DIY home security system. We also had some issues with signal interference between our sensors and hub — they kept going off line. According to Scout, these outages are due to RF interference and require updating and resetting the sensors. While it's not hard to do, if you have a lot of sensors — and you're consistently experiencing them going offline — this is a pain.The nice thing Scout does with its security system is monitor their performance, and proactively schedule and send updates to keep the system running smoothly. If your sensors go off line, it's most likely due to RF interference rather than Scout not updating them. GearBrain has been working with Scout Alarm for a few years, and we continuously rank it as one of our recommended DIY installed and monitored home security systems. We like how its systems are designed for apartments as well as homes, and the fact you can take its system with you when you move. Detaching the sensors from the walls, doors and windows is easy, as there aren't any nails to remove. Another nice feature of Scout Alarm is its hearty smart home integrations. Many DIY home security systems have a few smart home integrations. But Scout has integrates with a number of best of breed smart home companies, like Philips Hue, Yale, Nest and IFTTT. Adding these connected devices is simple, and not very complicated. When we added smart speakers, including Amazon Echo and the Lenovo Smart Display with Google Assistant, the setup couldn't be easier. We also liked the fact that you need a PIN to disarm your system — which is very important with security products that use voice commands. We think anyone who is in the market for a home security system would benefit from buying a Scout Alarm system, especially someone who moves frequently, and is comfortable installing items yourself. If you live in a rental property and want a security system, own a second home that you want to monitor, or a good starter kit that can expand as your home size grows, Scout is a good system. Scout doesn't require a contract. But it does require you sign up for a $9.99 monthly monitoring plan if you want the mobile app to arm and disarm your system, as well manage your home automation with third parties. The entry level monitoring plan will also relieve your worries if the power and internet go down. You just need to decide if you want to pay for this service which other DIY home security systems offer for free.